Just found another neat piece of technology. 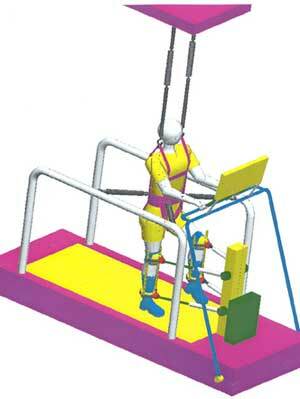 It is a robotic leg brace system that assists people in relearning how to walk. It reminds me of the exoskeleton systems the military has been working on for so long. This is a new head movement controled mouse that uses RF instead of IR. It was released at the CSUN conference earlier this year. Parts consist of a reciever, a transmitter, and a visor (sort of looks like a tennis visor).the operator must be within 15 feet of the computer, and it is supposed to have up to 1 pixel accuracy (can i even get that from a mouse??). The RF technology is the exact same stuff as what is used in the GyroPoint or the RemotePoint handheld RF mice (I haven't figured out which one it is based on). It looks like this will fit right into the 508 rules, which have just been released in final form. This device, in combination with Windows ME, which has an on screen keyboard, can give access to someone with only head movement. I don't think click and dwell is built into ME, except for the on screen keyboard. It seems like a strange name for a pointing device. Based on the name I would think it was some sort of souped up IP address maping software or TraceRoute. I suspect the visor may be a sticking point for some people. Or call us at toll-free at 1-866-BOOST HELP (1-866-266-7843). Vir Touch systems has recently released a new mouse design that assists computer users with severe vision loss to use graphically intensive software. 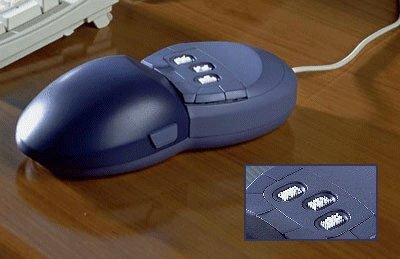 It looks similar to a standard mouse, except it has three areas each with 32 pins, similar to refreshable Braille cells, where the buttons would usually be. It looks like the buttons have been moved so they can be easily accessed with the thumb and little finger. The mouse allows the user to scan the image as if it were embossed on paper. In addition to getting a feel for the shape of a picture, the mouse is also supposed to translate patterns and color into tactile data. The mouse retails for $5000, and has only recently been released in the United States. Although the price seems to be high, it can offer some people access to graphics programs that have been inaccessible to people with severe vision loss.